Be the first to hear about their new releases and deals. Download the Booksprout app and search for H. M. Trey today! H. M. Trey was born in Statesville, NC where he currently resides. He earned his B.A. in Exercise and Sports Science from The University of North Carolina at Chapel Hill, and his M.B.A. and M.P.A. from Strayer University. Most of his professional career has been spent in the Human Services Field. H. M. Trey has been working in the Human Services Field in some capacity or another for over 19 years. Through the various jobs, H. M. Trey has gained experience working with individuals, both children and adult, that has been diagnosed as Developmentally Disabled, Autism/Asperger’s and who have various Mental Health issues. H. M. Trey has worked in Group Homes that have serviced Developmentally Disabled individuals and worked in mental health services involving Residential Level III group homes, Day Treatment services, Community Support/Case Management services, Intensive In-Home Services, and Foster Care Services. Some diagnoses that H. M. Trey has worked with are Oppositional Defiant Disorder, Conduct Disorder, Bi-Polar and other mood disorders, ADHD, ADD, Depression, Generalized Anxiety, Separation Anxiety, Disruptive Mood Dysregulation Disorder, Adjustment Disorders, Reactive Attachment Disorder, and Post Traumatic Stress Disorder just to name a few. H. M. Trey has experience working with Cognitive Behavioral Therapy techniques, Motivational Interviewing, and the Family Centered Treatment module. H. M. Trey also has a love for working with kids in the community and being a mentor. H. M. Trey was a part owner of a non-profit organization called Strengthening and Empowering the Lives of our Future (S.E.L.F., Inc.), which had mentoring, tutoring, and sports programs. H. M. Trey is no longer a part of S.E.L.F., Inc., but does have aspirations of creating another non-profit organization similar to S.E.L.F., Inc.
As it pertains to writing, H. M. Trey started his literary journey in 2008 where he began his first novel, The Wedding Man. H. M. Trey is a Contemporary and Romance writer. In 2014, H. M. Trey signed on to write under Peace in the Storm Publishing and released his 2nd novel, The Window to the Soul of a Man. Since this time, H. M. Trey has released three more full-length novels, She Will Be Loved, The Knife that Kills the Heart, and The Color of Love. H. M. Trey also was a featured writer in the anthology, The Soul of a Man 2. H. M. Trey is currently working on the remake of his first novel, the last part of The Window to the Soul of a Man and She Will Be Loved trilogy, and his first Christian fiction novel. 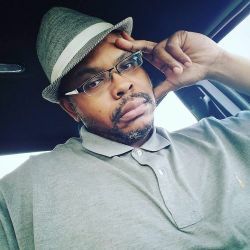 H. M. Trey also works as a senior managing editor with Real Life Real Faith Men of Faith Magazine, which is an electronic magazine that is released bi-monthly. From inspiration, to entertainment, to sports, to politics, to business, to mental health, and everything in between…the Men of Faith Magazine are strives to educate, uplift, motivate, inspire, and be a magazine that is written by men for men. The Men of Faith Magazine seeks to cultivate minds with insightful and entertaining knowledge that is meant to help someone in need of food for thought. The mission of the magazine is to address an array of topics that men not only want to hear about but also need to hear about. Not only does H. M. Trey work as a senior managing editor for the magazine, he is one of the contributors of the magazine as well. H. M. Trey’s column in the magazine is entitled Hurley’s Mental Note.